IPL is one of the most celebrated cricketing events in India. It’s the Desi Version of American Super bowl. Cheering your favorite team in an IPL match requires passion and some fans need drinks to accelerate that momentum. 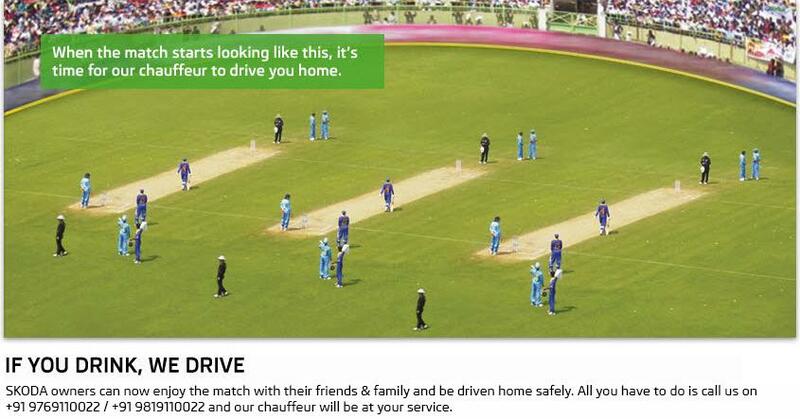 Now Skoda launches an exclusive chauffeur service to Skoda owners who wants to drink during the match. This extremely popular value added service gives you enough freedom to drink during the match and come home safe with this innovative initiative. The service is available only in Mumbai till 15th May 2013. Skoda especially designed this unique program to raise awareness about safe driving. Now cricket fans can register before going for the sporting event and get drunk. Every Skoda owner who registers for this service gets a chauffeur. Such programs not only enhance the brand image but also add lots of value to its customers. Unfortunately only Mumbai based Skoda owners can enjoy this benefit. Cricket fans who wants to watch live matches in pubs and restaurants in Mumbai could also enjoy the benefits of this program however registering ahead of time is very important. Skoda repeated this program after the huge response they got during the last season. So, if you are from Mumbai and a Skoda owner and an occasional drunkard, you are the luckiest dude to avail this awesome service from Skoda. 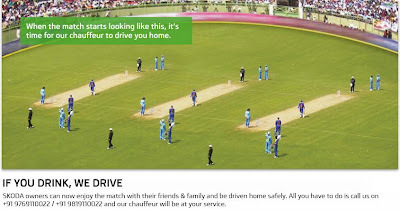 So, get drunk, enjoy cricket and come home safe.